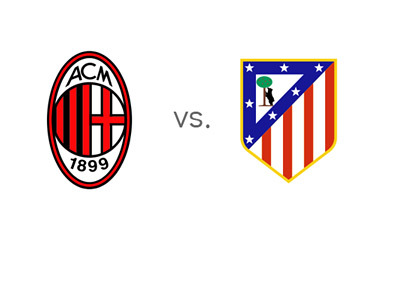 AC Milan will host Atletico Madrid in the first leg of the UEFA Champions League round of 16 on Wednesday, February 19th, 2014. This could be a great battle! AC Milan are having an off season on the domestic front. They are ninth in the Serie A tables at the moment and they are out of Coppa Italia. The Rossoneri are, on the other hand, the only Italian club left in the UEFA Champions League. The club has recently appointed a new coach, Clarence Seedorf, and the things are starting to look a little brighter. Mario Balotelli's most recent goal vs. Bologna sure put a smile on every AC Milan fan's face. The team finished second in Group H, behind Barcelona and ahead of Ajax and Celtic. Atletico Madrid are in great form this season. They are even on points with Real and Barcelona at the top of the La Liga tables and they breezed through Group G of the Champions League where they finished first ahead of Zenit, Porto and Austria. Atletico slipped recently with two Copa del Rey defeats to Real Madrid and a league loss to Almeria, but in their most recent outing, Diego Costa and his teammates beat Real Valladolid 3-0 and showed that they still got it. According to the odds, Atletico are the favourites to win in Milan and to qualify for the quarter-finals. AC Milan will have to do without Stephan El Shaarawy and Robinho due to injuries, as well as Riccardo Montolivo and Sulley Ali Muntari due to suspensions. The new signing, Keisuke Honda, will have to watch from the stands also, as he already played for CSKA Moscow in this season's Champions League. Atletico manager, Diego Simeone, will not be able to count on Tiago, Javier Manquillo and Filipe Luis due to injuries. This game has the potential to be a real treat.